In today’s video, we will show the Ultimate 2-person Doubles Game. It’s a game that most closely resembles a doubles game played with 4 people but that can be done with just two. 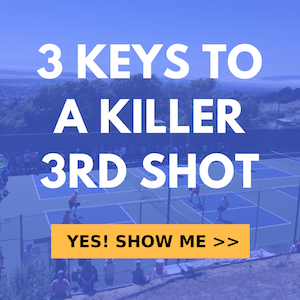 With it you can work all the skills that you will need for a full doubles game: Serve/Return, 3rd shots, Dinks, Drives, Lobs, Resets/Blocks & Everything in between. This game is especially great to do after you’ve drilled a few specific skills that you now want to insert into a live play situation that most closely resemblers a full doubles game.